Independence Day and like most communities, there will be fireworks. Like some soldiers with PTSD, dogs can react strangely or even violently to the loud booms. We associate fireworks and barbeques and pyrotechnics with our country’s freedom; your dog doesn’t. Most often, animals are terrified during this holiday. There are some tips on keeping your dog safe and reducing the stress of the holiday for your bulldog. Yes, it is the most obvious tip. It may be tempting to want your dog with you at all times while you are outside celebrating. Even if your bully is comfortable being outside most days, loud noises can terrify your dog. They can jump the fence and run away just to find safety. If you are going to watch fireworks away from home, don’t take your dog. The crowds of people and loud fireworks displays could stress your dog out more than ever before. Don’t even bring your dog and leave them in the car. They can suffer from heat stroke and possible brain damage. The best place for them is at home where they can feel safe and comfortable. 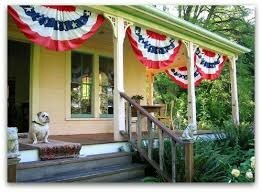 Choose a quiet place for your dog that is away from the festivities and in a cool area. Let your guests know it is off limits to minimize any problems. You can create white noise by leaving a radio, fan or TV on for your dog in the safe place. If your dog is prone to anxiety, make sure you have enough of their medication. Vet clinics aren’t open for business and emergency vet clinics don’t hand out tranquilizers. Head on down to your local pet store or a store like PetSmart and get an updated ID tag. This way if your bulldog manages to run away, whoever finds them can contact you. Shelters see a huge influx of animals the days following the fourth of July. This will help keep your dog out of a shelter and back to you. It is also a good idea to pick up a Thundershirt for your bulldog. 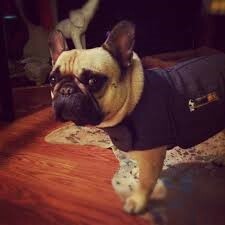 This is a jacket that you can put on your dog that creates mild pressure around the dog’s body. It works on the same principle as swaddling a newborn baby. It helps ease stress and anxiety better than sedatives. Millions of dogs have benefited from their owner’s dedication to finding a solution. If you are having a barbecue, remind friends and family that table food isn’t safe for your dog. If they insist on feeding your bully, keep some of your dog’s favorite treats handy. Keep your dog on his normal diet to avoid indigestion and stomach problems. Things like onions and garlic are dangerous to your dog if the ingest it. Alcohol and chocolate are also toxic for your dog. Don’t leave candy where your dog can reach it either. If there are children, remind them and their parents to keep their candy away from your dog. Some candy has an artificial sweetener called Xylitol that can be deadly to your bully. Bulldogs skin is sensitive, even to the sun. Only use animal safe sunscreen and bug spray this holiday. Overusing an insect repellent with DEET can cause severe neurological problems. Don’t let your dog ingest sunscreen that isn’t safe for animal use. It can lead to excessive drooling, vomiting, extreme thirst and lethargy. Lighter fluid can be irritating to your dog’s skin as well. Inhalation of lighter fluid can also cause breathing problems and aspiration pneumonia. 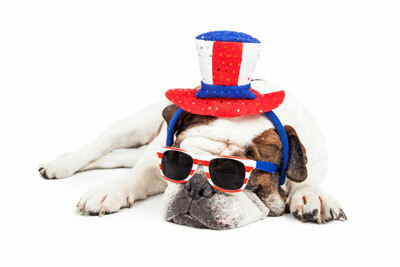 While you are having fun celebrating our independence, remember your beloved pooch. This is only one day for you but it could traumatize your bulldog forever. 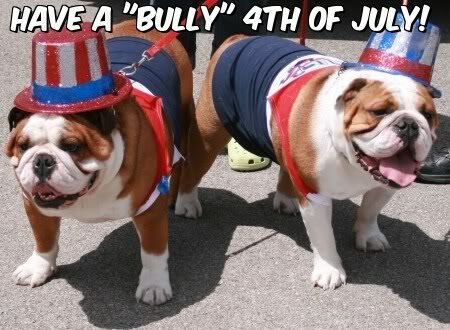 Follow these tips and tricks to help keep your bulldog safe and less stressed this Fourth of July.